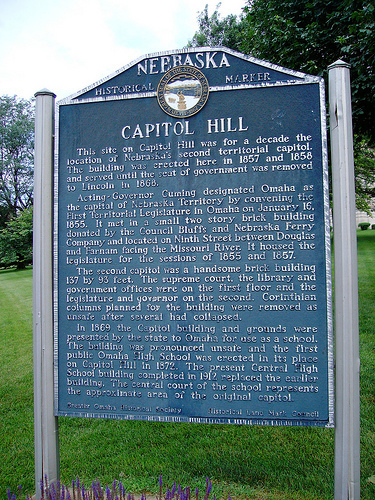 This site on Capitol Hill was for a decade the location of Nebraska's second territorial capitol. The building was erected here in 1857 and 1858 and served until the seat of government was removed to Lincoln in 1868. Acting-Governor Cuming designated Omaha as the Capital of Nebraska Territory by convening the First Territorial Legislature in Omaha on January 16, 1855. It met in a small two story brick building donated by the Council Bluffs and Nebraska Ferry Company and located on Ninth Street between Douglas and Farnam facing the Missouri River. It housed the legislature for the sessions of 1855 and 1857. The second capitol was a handsome brick building 137 by 93 feet. The supreme court, the library and government offices were on the first floor and the legislature and governor on the second. Corinthian columns planned for the building were removed as unsafe after several had collapsed. In 1869 the Capitol building and grounds were presented by the state to Omaha for use as a school. The building was pronounced unsafe and the first public Omaha High School was erected in its place on Capitol Hill in 1872. The present Central High School building completed in 1912 replaced the earlier building. The central court of the school represents the approximate area of the original capitol. “Capitol Hill,” Explore Nebraska History, accessed April 19, 2019, https://mynehistory.com/items/show/173.